As both historical researcher and book dealer I stumble across facts that, while delighting, do not fit into planned projects. ‘Woman and her Sphere’ provides a home for such orphans, rescued from the rubble of history. If you would like to order a copy of Art and Suffrage email me (elizabeth.crawford2017@outlook.com). Another of my ‘orphans’ was Kate Frye (1878-1959), who was resurrected by ITV and put (played by Romola Garai) in a series – The Great War: The People’s Story. ITV then commissioned me to write her life. This story of an ordinary Englishwoman will appeal to all those interested in a real life lived – from the palmy days of Victoria to the New Elizabethan age. For more details read here. The Great War: The People’s Story was broadcast for 4 weeks in August 2014. You can watch Episode 2, in which Kate Frye appears, here. Kate Frye’s diaries had already been the source of another book – covering her years as a suffrage organiser – Campaigning for the Vote: Kate Parry Frye’s Suffrage Diary. For details see here. Do consult the Links (on right) to see – and hear – the fruit of some of the research I have undertaken over the last few years – and to view the books and ephemera that I have for sale on Abebooks. I specialise in selling second-hand books and ephemera by and about women and produce catalogues of items for sale. Do get in touch if you would like to be added to my mailing list. Lists are sent by email. 2018 marks the 100th anniversary of Votes for (some) women. It will be a busy year for those interested in the women’s suffrage campaign – with events being held in towns and cities throughout the country. After graduating in history and politics, I worked for some years for Cambridge University Press and then J.M. Dent before combining work as a free-lance copy editor with caring for my three children. I began selling second-hand books and ephemera by and about women in 1984. Then this area was regarded by the trade as of little consequence. However, over time, interest in women’s – and family – history has grown and been reflected in an awareness of the importance of primary source material – books and ephemera – in composing a picture of women’s lives in the past. Intrigued by the material that was passing through my hands, I have, over the last 20 years or so researched and written several books. The first, The Women’s Suffrage Movement: a reference guide (Routledge 1999) grew out of the necessity of researching items connected with the suffrage movement in order to be able to catalogue them for sale accurately. ‘What’, I thought, ‘is needed is a compendium containing full information on the people and societies involved.’ A publisher’s editor to whom I mentioned the idea agreed – and I set to work. The Reference Guide was followed by The Women’s Suffrage Movement in Britain and Ireland: a regional survey, published by Routledge in 2005, which explains how – from 1866 -the suffrage movement developed throughout the British Isles. In between these two books I wrote Enterprising Women: the Garretts and their circle, published by Francis Boutle in 2002. In this I discuss the lifetime’s work of a group of efficient, highly-motivated women who transformed women’s lives in Britain in the last quarter of the 19th century. The work of the Garretts and their circle opened for women entry to areas of work and study from which they had hitherto been barred – medicine, education, and interior and landscape design – as well as, at the same time, campaigning for the vote. In 2009-11 I had the pleasure of helping to create the Elizabeth Garrett Anderson Gallery, generously funded by UNISON, in what was the ground floor of the former Elizabeth Garrett Anderson Hospital, now part of the UNISON Centre at 130 Euston Road, London NW1 2AY. 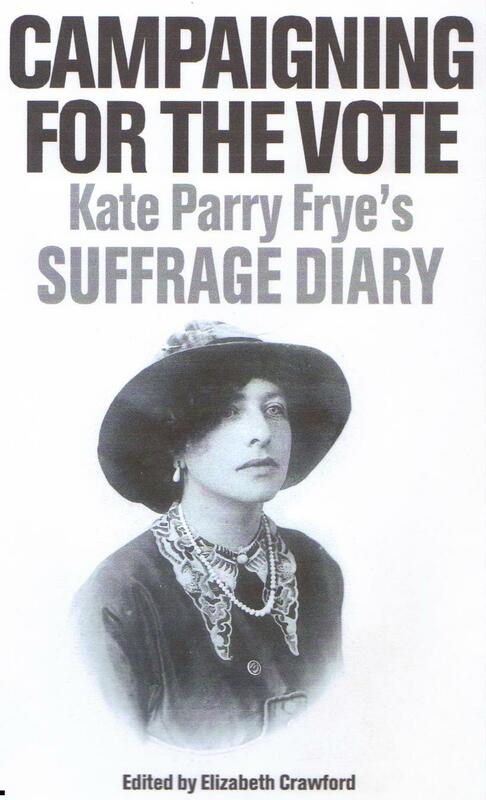 Campaigning for the Vote: Kate Parry Frye’s Suffrage Diary was published by Francis Boutle in 2013. For this I combined the two aspects of my work, turning a voluminous diary that I bought as a bookseller into another source of primary research material for those interested in the suffrage movment. 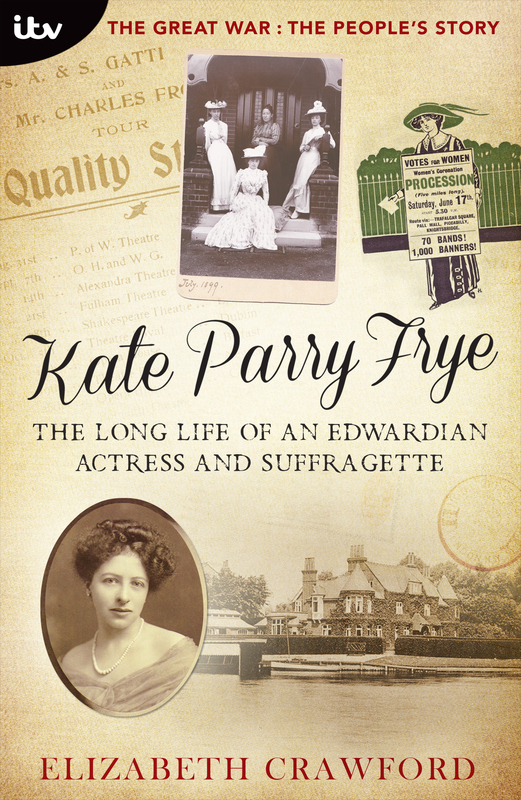 Kate Parry Frye: the long life of an Edwardian actress and suffragette was commissioned by ITV and published as an e-book in 2014. Over the years I have contributed to various radio – and television – programmes and given many talks – at academic conferences, to schools and to local history groups – on a range of topics associated with my researches. I was awarded an OBE in the Queen’s Birthday Honours in June 2018 for ‘services to education’ – with particular reference to the history of the women’s suffrage movement. Very impressive Does this mean that you won’t be sending your catalogue out or is this an addition. Yes, I shall still be sending out printed catalogues – this is just an addition. My hope is that the site will interest others; it rather entertains me. A very impressive web site and one that was sorely needed. My only regret here is that it was not available before I sent off my manuscript on suffrage memorabilia to my publisher. Your background information on suffrage artifacts is invaluable, particularly for an American who is very interested in the British movement, but does not have ready access to some essential manuscript material. As usual, your analytical skills are impeccable. Thanks for your comments. Do you have a publication date yet for your book? Not yet. I have been forewarned that this will be a slow process. Based on what the publisher has told me, my guess is 8-9 months, although I am trying to speed up the process on my end. Thanks for asking. Needless to say, your “The Women’s Suffrage Movement: a Reference Guide” was a very valuable resource for me. I have read her papers there – and am, therefore, very grateful to your grandfather for donating them! The Brights were, of course, a large Lancashire Quaker family – with 2 MPS in the 19th century – the more famous John Bright – as well as his brother, Jacob. Through intermarriage they created a powerful network – reaching through England and Scotland – supporting all the 19th-century radical causes. Bright women were prominent in the suffrage campaign. Because these families interested me so much, my book ‘The Women’s Suffrage Movement: a reference guide’ has an appendix showing the family trees of ‘The Radical Liberal Family network.’ ‘Bright’ is not, of course, an uncommon name, but your husband might find he was connected in some way to these radicals. Yes, I would love to receive a list of books and catalogues by email. Hello Elizabeth, what a lovely website! I’m going to order a couple of things from No 175, but before doing so, wondered if you ever come across copies of Christopher St John’s Ethel Smyth, – a Biography? This is a book I would dearly like to own if I found one resonably priced. I’m getting towards the first draft of my booklet about the Ipswich suffragettes. What great stories they are! Dear Elizabeth. I write as editor of the final volume of the Frederick Law Olmsted Papers project. We found your work on Fanny Wilkinson very helpful. In another letter of 1894, to his son John, then traveling in England, he suggests visiting “any of the revised church yard public gardens of Miss Carpenter’s designing.” In your work in the MGPA collection in the London Metropolitan Archives, did you come across a Miss Carpenter? We whall be grateful for any help you might be able to provide. Good to make contact. I must confess, though, that I am baffled by the mention of a ‘Miss Carpenter’ laying out church yards etc c 1894. I do not recall coming across anybody of that name in the MPGA records – or in such records of the Kyrle Society as survive. Do you think Olmsted just might have got the name wrong – and really meant ‘Miss Wilkinson’? If there had been a Miss Carpenter mentioned anywhere I am sure I would have pounced on her to discover more about her. Emmeline Sieveking was, of course, FW’s assistant – but, again, hardly a name one could mishear or mistranscribe as ‘Carpenter’. Incidentally, the previous year Fanny Wilkinson did have some kind of plans exhibited at the World Fair – presumably in the Woman’s Exhibition. WOuld Olmsted – as designer of the site – have taken any interest in such a minor exhibit? Did Olmsted’s son make any report back on the state of English public gardens? I agree. Olmsted surely must be mistaken. He was well aware of Fanny Wilkinson’s work with MPGA (at Lord Meath’s suggestion he was an honorary member) and expected to meet her when in London in June 1892. He was seriously ill for most of that visit, however, and I find no evidence that they did get together. One thing that Olmsted hoped to achieve was to have a separate exhibition for landscape architecture at the Columbian Exposition and he wanted Edouard Andre, William Robinson and other European friends to support that effort. He was not able to persuade the exposition’s planners to have such a dedicated exhibition, and so his firm’s work was a rather small display. I’m sure he knew of Fanny’s plans but he did not, so far as I can tell from surviving correspondence, comment upon it. I’ll keep you posted as I continue this odyssey. I just wanted to write and say thank you for this wonderful website and also for your publications The Woman’s Suffrage Movement and From Frederick Street to Winson Green. Both have been extremely useful for our project Fight for the Right: The Birmingham Suffragettes. We are particularly focusing on Hilda Burkitt, Bertha Ryland and Catherine Osler and are aiming to have our film finished by June this year. Your kind words are much appreciated – and encouraging. Coincidentally I have just completed an entry on Catherine Osler for the Oxford Dictionary of National Biography (which is doing a concentrated blitz on Birmingham personalities to coincide with the opening of the new library). Hilda Burkitt crops up briefly in my new book – to be published very soon. ‘Campaigning for the Vote’ is an edited version of a diary of a woman, Kate Frye, who worked as an organiser for one of the smaller suffrage societies – and who, when organising in Dover, stayed in digs with Hilda’s aunts, the Misses Burkitt. Thanks for this. I look forward to reading your DNB entry on Catherine, she’s a very interesting character, and your new book sounds fascinating. I’m on the point of publishing a book which takes in the events of 1913 at Tunbridge Wells and I am trying to locate a high res photograph of the burnt out pavilion at TW Cricket Club. I see you have one on your pages and winder if you might be able to direct me to the source. Interesting to read your letter in the recent edition of the antiques trade gazette.There was an intresting “Suffragette tea service” in an auction at Dreweatts of Bristol a few months back which might have been of interest to you (the items never made their reserve).I will contact you in the future if I come across similar pieces. I recently discovered your fascinating blog while researching Algernon Moses Marsden for my blog on James Tissot. Sybil Marsden’s story was so compelling that I included it, citing your work and providing your link at http://thehammocknovel.wordpress.com/. Thank you for all your excellent research into lives that would otherwise remain unknown and uncelebrated. Delighted to read your post on Algernon Moses Marsden. What a scoundrel – just the kind of chap to drive a woman into the suffrage movement. Happily, Sybil lived a good deal longer than you mention – dying in 1946 and leaving over £5000 – so her dressmaking business had clearly been reasonably successful. Elizabeth, thanks for alerting me to that error. Would you be so kind as to direct me to your source for Sybil’s biographical details (especially if it’s online)? I relied on an ancestry website, and I’ll need to correct this. Lucy ~ I found all her details on ancestry.co.uk – ie censuses & birth, death – and the record of her will. If you’re a subscriber to ancestry you’ll have no trouble accessing all this info. Elizabeth, I greatly appreciate your speedy help with this. Sybil’s apparent tragedy is thus averted! I am delighted that my good friend Marguerite Kearns told me about this wonderful web site. I have a long-term interest in suffrage, and just last year had my book published, Long Island and the Woman Suffrage Movement. I look forward to reading your articles and accessing the stories. Welcome! Good to have you on board. My message of a few minutes ago accidentally was sent before I had finished it. What I would like to ask you is: is there any possible way of accessing the National Archives for information on Edward Johnson Wilson and his ownership of the Rinkeries Skating Rink in Aldwych in about 1911. This is purely for my own personal curiosity and family history. I an writing to you from my home in Spain. My most sincere thanks for any information you may be able to offer. Hi Elizabeth, I wanted to let you know that I wrote a choral piece based on “To D.R. in Holloway” in 2009. I found the poem when i was commissioned to write a piece for a concert by a female a cappella group, Anthology, for their concert Songs of Protest and Civil Unrest. I greatly enjoyed reading your article on Joan Lavender Guthrie, and I wanted to invite you to take a listen to the piece. You can find it at http://www.evakendrick.com on the media page. Eva ~ I loved the piece – so atmospheric. May I add a link to the recording underneath my transcription of the poem? Elizabeth, thank you so much! Yes, please feel free to include the link under your article. I’m so happy this remarkable woman is getting some exposure and notice for her contributions. I too have orphans and yet there is still space for new reading. I would loved to have read Kate Parry Frye by Elizabeth Crawford. As it happens, my next WW1 topic for reading and reviewing is the role of women doctors during the war. The first two women in the history of Australian universities graduated from Melbourne in 1891, so they were hardly a powerful group by 1914. But the story is a terrific one. Good to hear from you again, Hels. My biography of Kate Parry Frye is only a click away – if you want to read it. No print edition, alas, but if you use an e-reader it’s available from both Amazon and iTunes. Are you still sending printed catalogues out by chance? If so, how do I sign up? Kate Parry Frye: the long life of an Edwardian Actress and Suffragette was deservedly commissioned by a tv station and published as an e-book. Well worth giving to feminist history buffs. Well, Helen, I’m so very grateful to you for the recommendation. You may remember me for my work on Mary Hays (1759-1843) who, I have just learned, was the aunt of Matilda Hays. Through the new evidence produced by Timothy Whelan as Editor of the Henry Crabb Robinson Project and shared with me, I am writing a “female biography” of Mary Hays for a special issue of Women’s Writing on Female Biography that Mary Spongberg and I are editing. I would appreciate any information about Matilda Hays that adds to that more widely available. I have just read your intriguing piece, https://womanandhersphere.com/2014/02/03/women-writers-and-italy-stalking-matilda-hays-and-adrienne-hope/. It is inspiring to see your continuing superb work. Gina – good to hear from you. I’m delighted that you are going to tease out more about the mysterious ‘Max’ Hays. My knowledge, alas, is more or less confined to the contents of this post. I found ‘Adrienne Hope’ so interesting because of the picture it painted of the expat life in Rome in the mid-19thc. Let me know when you publish anything on Matilda Hays and her circle. Hello, this indeed is a very valuable source for women’s’ voting right in a historical aspect. As a a matter of fact, we are currently working on a documentary called ‘The Vote,’ which mainly revolves around the human’s voting right. And we deemed this source very valuable and found this photo of Emily Davison laying dead on the ground on the day she got run over by the horse. We are actually in a bit of rush and I should have told you this earlier but we are planning to use the following photo for our documentary. Our deadline is 4/4. Please do tell me if there is any procedure that we have to go through in order to use this photo. Do you have a copy for sale of A. F. Wedd’s Love-Letters of Mary Hays? Do you have a copy of the pamphlet, A Suffragette Story by Grace Roe, referred to in the bibliography for the entry on Grace Roe in your reference guide to the Women’s Suffrage Movement. I am thrilled that I have found your site. It is such a wealth of information. Thank you for keeping this history alive and demanding that it be accurately relayed and portrayed. To that end, I am a jewelry designer in the USA setting out to create a meaningful, intelligent and beautiful group of jewelry that will represent the movement, the women and the struggle. I design for museum stores and it is very important to me that both my imagery, and my educational inserts that accompany it, are correct. I would very much appreciate your thoughts and guidance to visual materials I might want to consider while designing. I found your site when reading your rebuke of considering all green, purple and white jewelry of the period “suffragette jewelry”. I completely agree with your stance. I thank you in advance for any time and attention you can give to my request. I am very excited about this collection. It has been forming in my head for almost a year and I need to start to create it. It would be wonderful to bring it to life in honor of the centennial of the 19th amendment. I know you are terribly busy this year so please don’t bother with this if so. My great grandmother elsie glover knight was adopted by Elizabeth knight , do you have any information on her.